A driver's road rage outburst which was caught on a motorcyclist's helmet camera has sparked a huge social media reaction. Ronnie Pickering's expletive-laden rant has been viewed more than a million times since it was uploaded to YouTube. He was filmed asking the rider "do you know who I am?" and challenging him to a "bare-knuckle fight" after being overtaken. According to reports, the 54-year-old grandfather has since apologised. The BBC has approached Mr Pickering for a comment. In the footage, Mr Pickering asks the motorcyclist: "Do you know who I am? You soon will do." The motorcyclist replies: "Do I care? Who are you then?" "Ronnie Pickering", responds Mr Pickering. This particular section of the pair's exchange captured the imagination of social media users, prompting dozens of parodies and tweets. 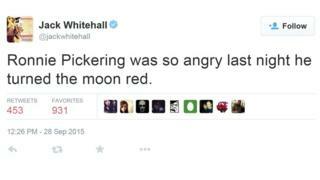 Comedian Jack Whitehall tweeted: "Ronnie Pickering was so angry last night he turned the moon red." While former BBC Two Dragons' Den star Duncan Bannatyne tweeted: "Who is Ronnie Pickering?" But the video met with a mixed response in Mr Pickering's home city of Hull. Ex-Hull City footballer and boxer Curtis Woodhouse tweeted: "Serious question, do you class Ronnie Pickering as a proper world champ? Or just a regular champ? #WBA"
Gavin Mellor tweeted: "Don't need City of Culture to put Hull on the map when you've got #ronniepickering"
Ashley Brown tweeted: "It's a proud day in Hull as the rest of the country get to meet #RonniePickering"
Mr Pickering told the Hull Daily Mail, the rider was "baiting me so I thought I would give him a few of my thoughts". Humberside Police said it was investigating the video footage and whether an offence had been committed, but no official complaint has been made.